To be a leader, in whatever field and whether born or bred, one requires just as much fortitude as he does the respective skill and acumen. It’s not just about possessing the intellect to make the right choices for yourself and, more importantly, those following you; it’s about being able to take a blow, pick yourself up, dust yourself off, and get back into the fray. This resilience could perhaps be best personified by the one and only Napoleon Bonaparte. Showing that physical stature had little to do with his capability to lead a nation (though in reality, we do realize he wasn’t that short, but he really wasn’t very tall, either), the French military and political leader must have been imbued with the grit of Aries and Athena to have gone through numerous wars, the French Revolution, as well as exile before his death at the age of 51 in 1821. Though some will view him as somewhat of a crazy dictator in his time, they too would have to agree that he was an exceptional leader during his reign. It’s no surprise that watchmaker Abraham-Louis Breguet, when tasked to create timepieces for Napoleon, would have taken inspiration from such similar qualities of strength and intellect befitting of such a person. 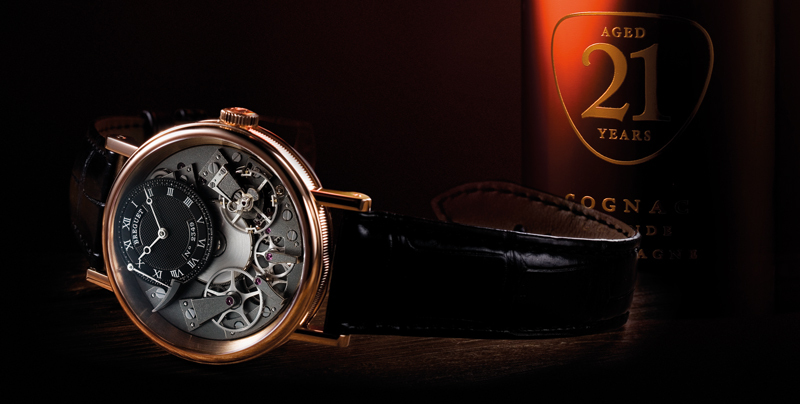 In particular, the iconic “Tradition” series, which is a modern adaptation of Breguet’s Souscription pocket watches where the dial and the movement are displayed on the same plane, showcases the beautiful yet functional pare-chute shock-absorber that fortifies the timepiece against any inevitable knocks or drops that occur. This internal strength, coupled with the charcoal-gray alloy of precious metals of the movement, as well as the iconic pomme hands on the dial housed in the coin-edged case, make for a timepiece that is simply brains, brawn and beauty rolled into one. In the same way, Courvoisier, which is said to have been the French general’s cognac of choice, has become very much a leader in its own right with the launch of the first range of cognacs that comes with an age statement: the Courvoisier Connoisseur Collection. Crafted from rare grapes selected from some of the most exclusive crus in Cognac, Courvoisier 12 brightly showcases grapes of the Borderies region, with notes of violet and orange blossom over spicy tones of clove and ginger wrapped in delicate vanilla, while Courvoisier 21 brings the Grande Champagne region to one’s palate with notes of dried fruit and hazelnut with cocoa, honey and coriander, finished with a subtle hint of leather and fine cigar. Such exquisite blends would only be possible with the forward thinking of individuals from generations past overseeing these uniquely aged cognacs. So should you, dear reader, find that you too are in a position to guide the way so others may follow, we trust that you will surround yourself with possessions that embody the attributes found in leaders like Napoleon and, dare we say, yourself. In times like these, we raise a glass to you, for it is truly a time for celebration.